But I am chucking my plans out the window to focus on what everybody really seems to want to know: What did I buy in Paris? But honestly, I could have done a ton more damage. Thank goodness my personal-accountant-for-life XFE was there to 1) help convert euros into dollars (math is the devil’s work.) and 2) ask the super important question of “Yes, that is yet another cute printed top, but is it $200 U.S. cute?” The answer was, invariable, no. We spent Friday wandering around Marais, which I had read had a lot of good little boutiques, and indeed, they did. We went to the vintage shop, Free ‘P’ Star, which was very good, if a bit crowded and manic. We also hit the large department store, BHV (amazing – they even sell power tools!) and some of the smaller boutique chains like Abou d’Abi Bazaar, Zadig et Voltaire, APC, Maje, Comptois des Cottonieres, and a slew of others I can’t remember, but again, I felt like the prices were a bit high. Finally, I made my first purchase at a Mango on Rue de Rivoli. I love Mango. I really, really do. I bought a tan sweater-cape-y thing that I absolutely didn’t need but after having gone in and out of about 20 stores, I was starting to get worried that I had forgotten how to use my credit card. Plus, the sweater was just so cozy and soft and seemed like the perfect transition item for fall weekends. Add skinny jeans, boots and a long necklace and you’re done. While I was in trying an armload of stuff on at Mango, my personal-stylist-for-ever XFE saw a girl walking by with a Promod bag. We discovered Promod when we went to Milan in March. During that trip, I hit the Promod pretty hard, picking up a couple of dresses, some tops, and some knee high boots. However, this trip, I wasn’t really feeling their retro 1970s stock. Lots of earth tones and groovy patterns. We didn’t even know that they had Promod in Paris, but XFE looked up the nearest location on his Blackberry, and we were off. I bought this cute polka dot shirt and a heathered white Henley. There were probably a lot more stores along Rue de Rivoli, but it was getting late and we had to get back to the hotel to get ready for dinner. On Saturday, we went in search of what the French call “stock” stores. These are stores related to some of the major chains we had seen the day before that carry last season’s stock at about 50% off. We went in a lot of them, including Et Vous and the gorgeous Gerard Deral, but again, I didn’t feel like the prices were all that great. But I did get some good deals, including this cute gray leather and metal belt from the NAF NAF stock store on Rue d’Alesia, and an adorable camel and black skirt from some chain store I cannot remember the name of. The real winner of the weekend though was Kookai Stock on Rue Réamur. We were there for ages and I was totally overwhelmed by the all the great choices. I settled on this green cowl-neck sweater dress and the #1 best deal of the entire weekend, this black silk and sequin party dress that came out to only about 27 euros. Hands down, the cheapest thing I bought all weekend. And, it makes a delicious little sequine-y, rustling sound when I put it on. That dress is a party waiting to happen. Kookai was a serious test of willpower and pocketbook control. The prices and quality were all over the map, and by this time, I was in the midst of some serious shopping fog-brain. I could no longer tell what was a good value, what was good quality versus what would fall apart, what was unique and unusual. Therefore, I wanted to buy everything. It was the store where XFE had to keep reminding me of the conversion rates. Yes, that’s right. 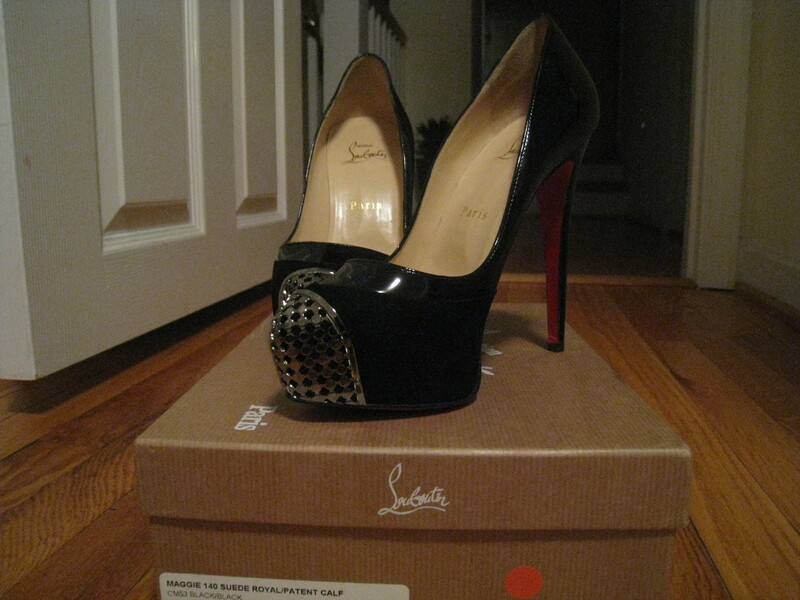 Those are my new Christian Louboutin shoes. Courtesy of XFE. You’ll think I’m lying but I actually had to talk him out of buying a second pair. He acted like it was a Payless BOGO deal in that store. The boy has a shoe problem. The store on Rue de Grenelle was like a tiny little jewel shop. And, sorta like a club. The door is locked and there’s a door guy/bouncer who plays gatekeeper. He told us that the store was currently full and we had to wait about 10 minutes until some clients had left. Once inside, we didn’t feel pressured at all and took our time making our final selection. We ended the weekend of shopping frenzy with a trek to Montmartre on Sunday where I was determined to find the elusive APC Surplus, the stock store for the iconic French brand. We found it, but again….the bargains weren’t quite up to my standards. I’m not ashamed to admit I’m the type of girl who will wear a pair of $800 shoes with an $80 dress. Believe me, there were no $80 dresses at APC Surplus. There weren’t even $80 t-shirts there. Everything was about $100 and up. But, as we were leaving APC empty-handed, XFE noticed a very cute gray short-sleeved dress in a shop window across the street. We went over to Ysasu and were totally charmed by the shopgirl who was so chic yet very nice. I liked the dress, but again, I was on the fence and my shopping compass was totally out of whack by this time. I kept asking myself, “was it really, really special and unique?” XFE thought I was crazy since it was a designer-owned shop, which meant a lot of the stuff was one-offs and none of it was sold in any of the stores we’d been to at this point. The designer had some beautiful one-of-a-kind dresses, but they were all cut to sample or runway size and far too small for me. The shopgirl was so cute trying to make me feel better about not fitting a sample size (as if I’ve ever let THAT bring me down). “I tell my boss not everyone is a Barbie doll,” she said in an adorable French accent. He had this one cream and black wide horizontal wavy stripe dress that was a bit longer in the back and just gorgeous. But, let’s look at the shoes again. YES. 2 things. 1 – I die. 2 – never turn down a second pair of loubitons. Ever. I die. On point number 2: I just don’t want to appear greedy. I feel confident there will be other Louboutins in my future. One pair per trip is enough.